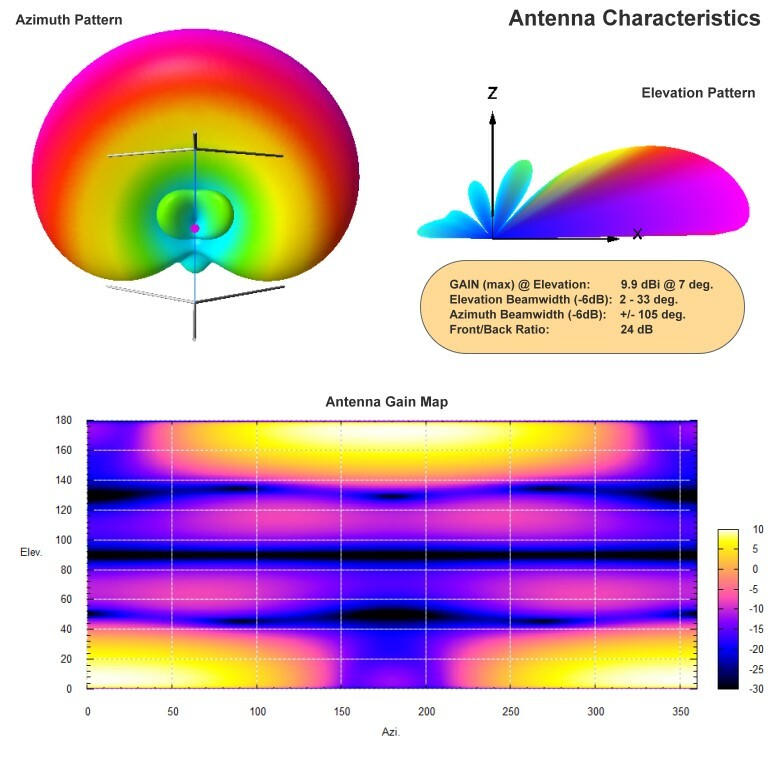 The Cardioid Pattern antenna is designed using a two element vertical phased array architectecture. A pair of 5/8 wavelength radiating elements are driven with an optimised phase difference to produce the cardioid pattern. This antenna has its own counterpoise system and has been modeled over an excellent quality ground with adequate moisture content to simulate good soil conductivity and dielectric constant. 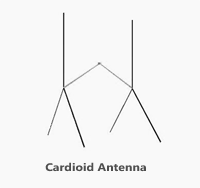 The Cardioid antenna system has a remarkable elevation pattern and features a very low angle radiation capability along with upper-side -6dB elevation cutoff point at a fairly high angle of 33 degrees. This makes the antenna ideal for very long range DX as well as for medium range operation. The peak gain of the antenna is an impressive 9.9 dBi. The USP of the cardioid pattern antenna is an extremely broad azimuth beamwidth. The antenna has an azimuth beamwidth of 210 degree (-6 dBi). In simple terms, the cardiod pattern antenna has a viewing capability similar to a wide angle camera lens. It can transmit and capture signals to and from stations located across continents. At any beam head setting this antenna is capable of working across a full hemisphere of the globe. Cardioid antenna is excellent for paticipating in group QSOs with station geographically spread across various countries and continents.